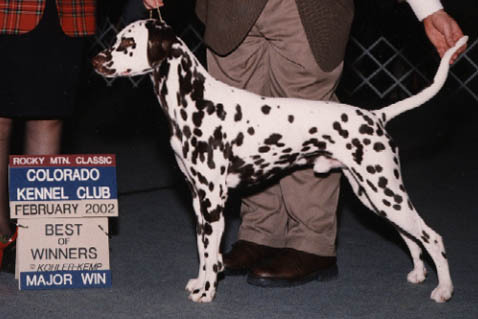 Out of the 2003 Halloween litter, Potter started off with a bang, winning the 6-9 month Futurity and the Novice Dog classes and taking second to his brother in the 6-9 month Sweepstakes class at the 2003 Dalmatian Club of America's National Specialty. Potter was also Best in Sweepstakes at the 2004 Greater Washington Dalmatian Club Specialty and Winner's Dog at the specialty supported National Capitol Kennel Club show that same weekend, picked up back to back majors at the Heartland Kennel Club of Florida and finished with his 5th BOW at the Central Florida Kennel Club. Potter's UKC career was equally exciting. Finished in a single weekend with a Reserve Best in Show and a BEST IN SHOW. Breeder: Mary-Lynn Jensen, Ph.D. Owner Keith & Katrina Meals & Mary-Lynn Jensen, Ph.D.